"Our organization operates emergency shelters. I have a total of 32 bathrooms to deal with. Our bathroom toilet paper dispensers are removed daily from vandalism. I have purchased many so called vandal proof toilet paper dispensers that might have lasted two days before needing to be replaced. Since purchasing Vandal Stop AA-JRDx1 dispensers in January 2015 we have not had to replace one unit. The products are as they say "VANDAL PROOF": there is no way anyone could destroy them. Their products are excellent as well as their 5 star customer service. Highly recommend their products." Homeless shelters present a unique challenge when it comes to bathroom vandalism and toilet paper theft. Serving a community with limited budgets as homeless shelters do, it is imperative that every dollar goes as far as possible. Paper theft is a common problem at homeless shelters as individuals pilfer the rolls for use on the street. This pilfering can become very costly very quickly and can quickly eat away at already very tight budgets. Vandal Stop Products line of vandal resistant toilet paper dispensers, safety mirrors and soap dispenser dispensers are the perfect solution for homeless shelters. Over the years, we have many homeless shelters come to us needing help with their rising costs to serve their clients. Our 12 gauge stainless steel units with our 10 year standard and 20 year optional warranty against vandalism is unmatched in the industry. We overbuild every aspect of our products so that you can ensure that your homeless clients will have the paper they need in your restroom but cannot pilfer your costly soap and paper supplies. The savings of adopting Vandal Stop solutions generally can pay for itself within three years and return money back to the shelter every year there after. Take for example an average shelter with 2 restrooms and 5 stalls in each restroom. If on average the 10 plastic dispensers are vandalized ~2 per year and need to be replaced, and your paper rolls are stolen 6 times per year per stall than the total cost of replacing / repairing that plastic dispenser when factoring things like salary, benefits, insurance, parts and other factors can cost the homeless shelter as much as $33,000.00 in lost budget. 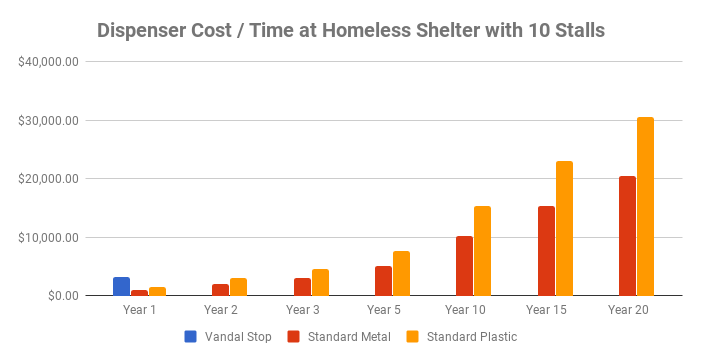 Contrast that to Vandal Stop Products where though there is a higher initial adoption cost, we will save you money year after year because our dispensers do not need to be replaced and the homeless clients are no longer able to pry the dispensers open to steel the paper.